At time of writing, there are five collections written by Nick Abadzis of his regular tenth Doctor Adventures comic. The Tenth Doctor Adventures are published by Titan Comics and are written by Nick Abadzis with art by Elena Casagrande, Giorgia Sposito, Arianna Florean, Eleonora Carlini, Claudia SG Ianiciello, Leonardo Romero, Rachael Stott, Iolanda Zanfardino and many others. 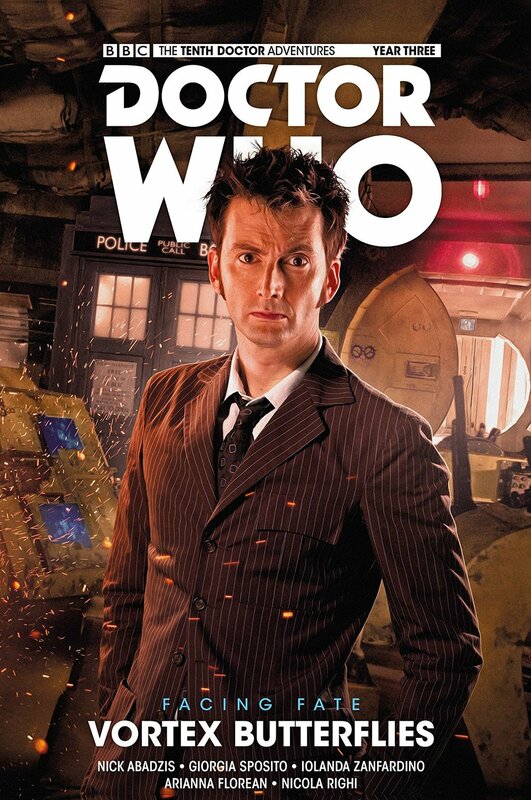 To date, there are nine, widely acclaimed collections of Doctor Who comics featuring the tenth Doctor (David Tennant) and his companions Gabby Gonzalez and Cindy Wu, plus a complete YEAR ONE Collection (also featuring stories by Robbie Morrison). Additionally, The Lost Dimension Book One collects two stories featuring the Tenth, Eleventh and Second Doctors in a longer arc co-created with Cavan Scott and George Mann. If you prefer to read on a tablet, you’ll find links to ComiXology below. If you prefer to buy digitally or buy single issues: ComiXology have the original issues as well as the collections. BBC, DOCTOR WHO (word marks, logos and devices) and TARDIS are trade marks of the British Broadcasting Corporation and are used under license. BBC logo © BBC 1996. Doctor Who logo © BBC 1996. TARDIS image © BBC 1963. Used with permission.